Symbols used for signes-de-renvoi vary widely in form (see fig. 1). Crosses, patterns of dots, arrows, and combinations of dots and lines were common symbols used for signes-de-renvoi. A signe-de-renvoi is normally neither a number or a letter in the symbol set used for the primary text; in that sense it is distinct from the primary text, and it signals content that is also spatially separated from the main text block. Signes-de-renvoi are primarily used to link corrections, commentary, annotations, and other marginal content to the main text, in what historians of print sometimes call a keying system.2 They should be differentiated from symbols used as finding or indexing aids, such as capitulum, paraph, or section marks that occur in the main text block or provide cues in the margin. These visual indexing strategies use fixed positions on the page to indicate textual structure and aid searches for particular content, whereas signes-de-renvoi are bi-directional linking devices, requiring the reader to leave and return to the main text, and thus guiding the reader from text to margin and back again. Signes-de-renvoi were used in production and correction of texts at all stages of the life of a manuscript to signal points of correction or add supplementary material. They save extensive corrections or annotations from becoming crowded and disorganized, enabling a simple process whereby the reader can find the note or correction easily and quickly return to the primary text. Signes-de-renvoi began as linking devices for corrections, particularly to supply material that had been omitted from the main text. From the tenth century onward, they were also used to link the main text to glosses and other types of marginal annotation. Throughout the rest of the Middle Ages, they were commonly used for both functions – correction and discursive annotation – but their use and form were never widely standardized. When print technology restricted the number of possible symbols to those in the fonts available to printers, and as the heavily glossed text became less normative in printed books, the forms and usage of signes-de-renvoi were greatly reduced – except in the case of alphabetical or numbered marginal annotations, which persist to the present day as footnotes and endnotes. Signes-de-renvoi have their roots in early omission and insertion signs. In Greek manuscripts from as early as the first century, text that had been mistakenly omitted was supplied in the top or bottom margins and pairs of words and/or symbols directed the reader to the location where the supplied omission was to be inserted. E. A. Lowe found, in western European manuscripts of the fourth through eleventh centuries, a range of such signs, including obeli, asterisks, crosses, and other combinations of lines and dots. In the fourth-century Codex Sinaiticus, for example, a pair of arrow-shaped signs show where the missing words ?a??? e??? ("being ill") should be inserted into the text of Luke 7:2 (see fig. 2). 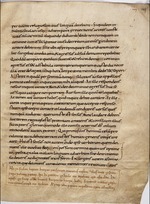 Early Latin manuscripts also used the abbreviations hd and hs (hic deorsum and hic sursum, meaning "here downward" and "here upward") to direct the reader to the top or bottom margins. 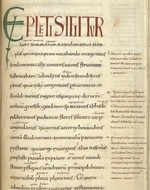 The meanings of the hd and hs abbreviations were often not understood by later scribes, who nevertheless continued to use them as linking devices.3 For example, Insular (especially Anglo-Saxon) scribes from the late seventh century onward used d in the main text to link to h in the margin.4 When the directional meaning of hd or hs is not understood by a scribe and the abbreviation is repeated both in text and in the margin, the sign has been reduced to "a mere signe-de-renvoi. "5 Signes-de-renvoi were first used in the same way as, and sometimes together with, the hd and hs abbreviations: that is, as linking devices to indicate an omission and insertion.6 Fig. 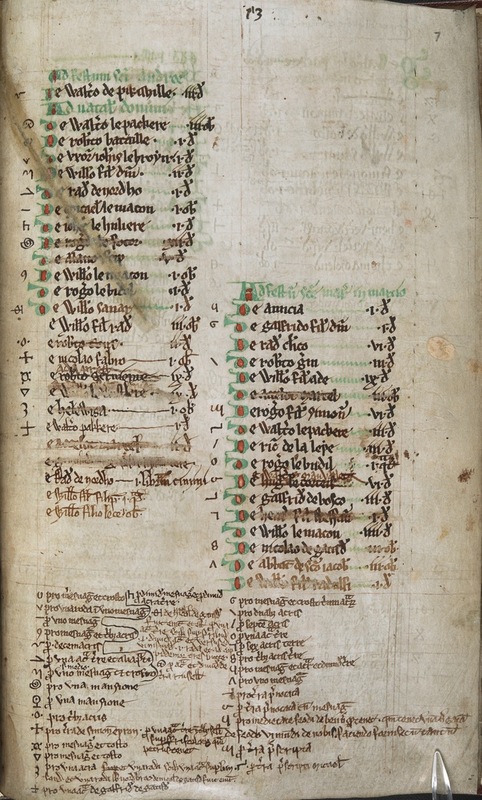 3 shows a pair of cross-shaped signes-de-renvoi used by Ælfric of Eynsham in an autograph manuscript of his Catholic Homilies to link missing text, supplied in the lower margin, to an insertion point in the main text block. The itinerary maps at the beginning of Matthew Paris' Chronica Majora facilitate interaction. 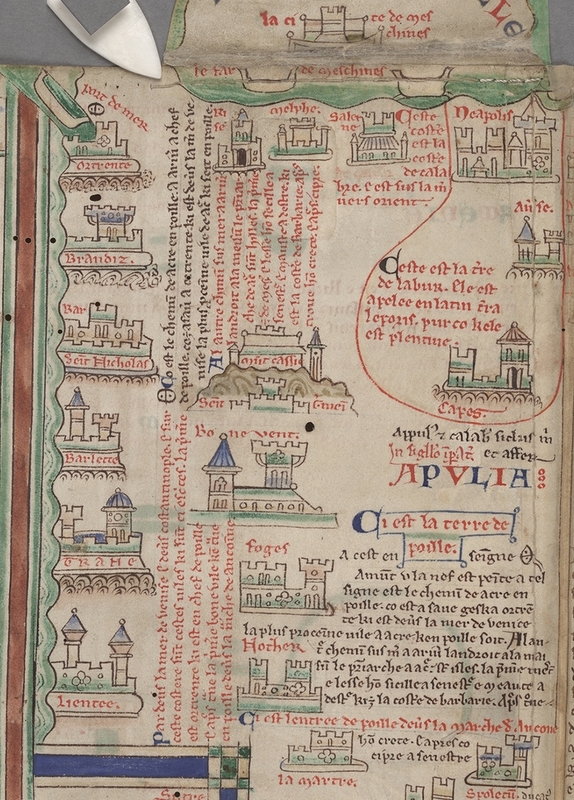 The maps associated with this thirteenth-century medieval chronicle have been described as an "imagined pilgrimage" for those who were not able to travel.15 The Cambridge MS of the Chronica Majora makes innovative and interactive use of a signe-de-renvoi in the prefatory maps. The sign bridges the gaps between elements of the manuscript that are not illustrated, such as the wide gaps of ocean or land that have to be imagined. The pages have extra flaps that can be unfolded to expand the surface of the page. According to Daniel Connolly, "this text also visualizes the route that has been lost in the working of the flap (that is, the route through Apulia). Here, however, that route is no longer a road or a series of cities; it becomes, at the dotted sign θ, a boat and its path through the Mediterranean – but not even a route so much as a sign of route making. "16 Thus Connolly suggests that the sign symbolizes the mode of transportation from one city to another, and that the symbol was chosen to facilitate this metaphor and so to improve interaction. Connolly explains how the dotted linking sign (θ) orients the reader and maintains a route through the map of cities. When the reader comes across the sign in the text of the itinerary, the corresponding sign by the image guides the reader through the visual elements (see fig. 8). 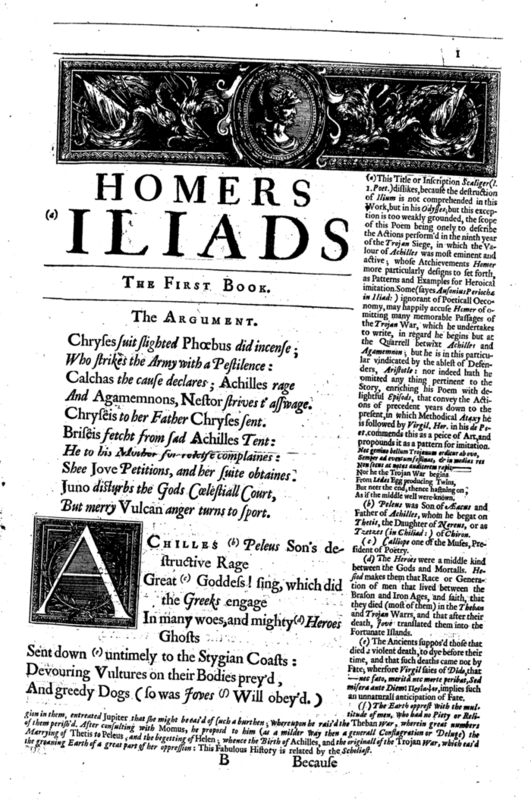 When the text in the margin is oriented in such a way that the reader must rotate the page to read it, the sign is also rotated so that it is oriented correctly in relation to the image, helping the reader to determine which way to orient the page.17 Hence the sign in the Chronica Majora enhances interactivity, orients the reader, and suggests a metaphorical explanation for travel that creates a more immersive reading experience. Many physical characteristics of the manuscript page were adopted by print. 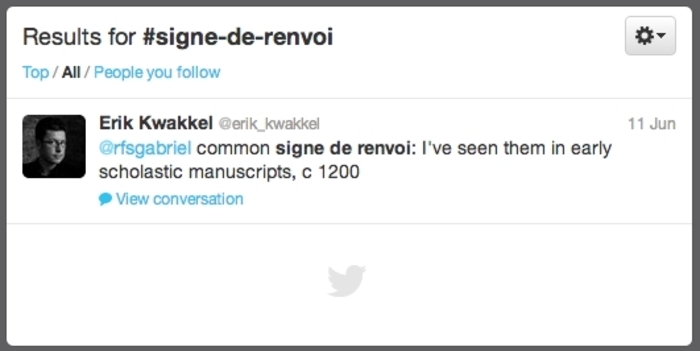 Linking devices for annotations, including signes-de-renvoi (often called reference marks in print contexts), continued to develop in the production of printed books. However, whereas symbols used in manuscript annotation are potentially unlimited and often idiosyncratic, printed reference marks are restricted by availability and quantity of the types in a printer's font. For this reason, linking symbols for annotations in print became much more standardized. Asterisks, daggers, and other symbols that were used in manuscript annotation and correction were often used as signes-de-renvoi in early print. 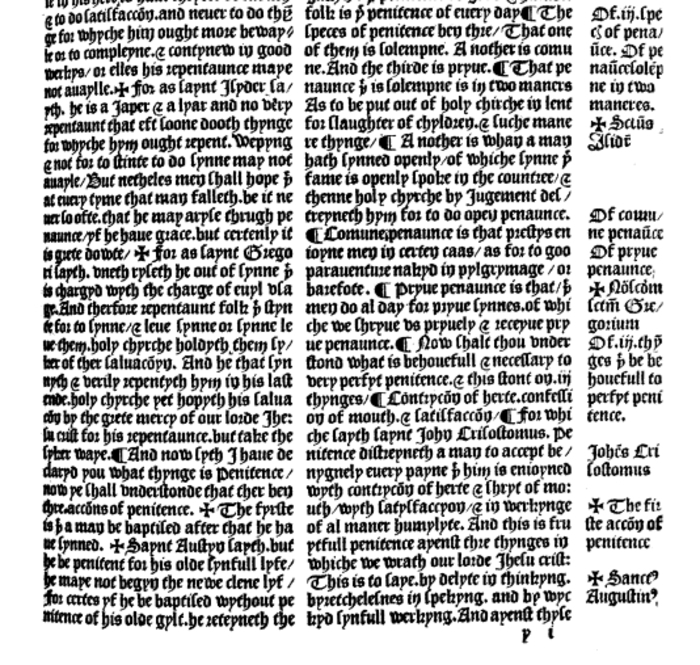 For example, Wynkyn de Worde in his 1498 edition of Geoffrey Chaucer's Canterbury Tales solved the problem of linking marginal glosses to the inner column of the prose Pardoner’s Tale by employing crosses as reference marks (fig. 9). However, de Worde's layout primarily relies, as did the medieval text-and-gloss format, on spatial proximity to guide the reader; the cross symbol he used as a linking device could not provide the precise one-to-one correspondence of a full system of signes-de-renvoi. Letters of the alphabet, which were sometimes used as signes-de-renvoi in medieval manuscripts, were unambiguous, ordered linking symbols available to printers, as were Hindu-Arabic numerals.18 The marginalia of the 1560 Geneva Bible (fig. 10), among the most widely read early modern texts, are iconic, and particularly instructive when looking at early printed annotation.19 Like many medieval Bibles, the 1560 Geneva Bible is full of marginal notes and commentary. 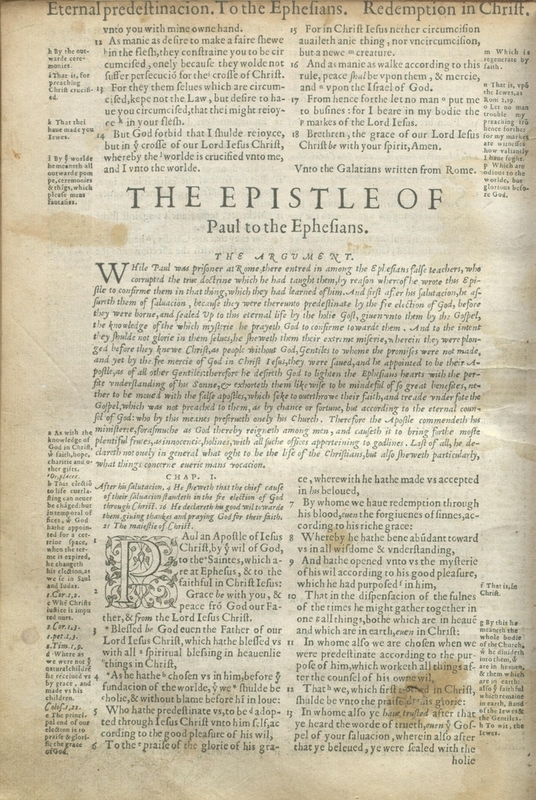 For example, at the beginning of Ephesians, there are three types of annotation used on the same page: asterisks, a symbol for textual variants (“), and lettered marginal notes. These symbols distinguish different types of annotations. Asterisks and the alternate reading symbol (“) provide a quick note or cross reference, while lettered footnotes provide commentary. Elsewhere, two pipes (||) are used for alternate readings. The two medieval functions of signes-de-renvoi in medieval manuscripts – correction and annotation – shifted in print environments. 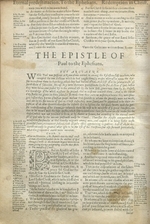 Early printed books might still be corrected by hand, but, by the sixteenth century, corrections were usually compiled in errata lists or incorporated into later print runs.20 The practice of surrounding an authoritative text with glosses and annotations persisted into early modern print environments, however; thus not only could glosses and commentaries be printed around the main text block, but modern readers, like medieval scribes, continued to supplement their printed books with their own annotations.21 Scholars were also regular users of these types of marginal annotations, employing them for scholarly editions of texts and for their own commentary. Modern print continues to use text annotation, especially in scholarly and religious texts. Footnotes and endnotes are the usual form in modern print for this type of linking. Though the symbols are not as varied as signes-de-renvoi, they perform a similar linking function for modern readers, using characters already in sequence and readily available in type. In print environments today, the one regular function of a text-to-margin linking device that remains is to link main text to annotation. Hyperlinks are obvious candidates when trying to determine a digital equivalent of the signe-de-renvoi. Online texts often use hyperlinks to connect citations and annotations to anchors in the main text, and these devices enable the exit from and return to a location in the main text. But similarities between the ways we engage footnotes and links in digital environments, and human interactions with signes-de-renvoi in a manuscript environment, depend on interface design. Online linking is a machine-readable practice. Usually, a link is identified as a hyperlink by a difference in colour and/or a symbol that indicates that a link will be opened in another window, but after the user clicks on the link, the rest of the process is carried out in sequence by the user’s computer, Internet Service Provider, the host server, etc. Different navigation strategies produce different reading experiences. When a link directs the user to an anchor on the same page, the user must be provided with a means of returning to the previous location (or must use the "back" command in the browser). When exterior links are opened in the same window or another window or tab, the user must become oriented to a new page. This process is much different from that facilitated by signes-de-renvoi in purely visual, human-readable, and human-navigated manuscripts, which rely on the uniqueness of the sign on the page and on human intuition to connect two sections of content which are spatially fixed. The hyperlinks that most nearly resemble signes-de-renvoi are those that present supplementary content without requiring the reader to navigate away from the original location: for example, pop-up windows that appear on mouse-over require minimal movement of the hand and eye. Symbols in digital environments that signal more content are also similar to signes-de-renvoi in the variety of their forms, from the icons in task bars, to downward facing arrows that signal drop-down menus, to information buttons (i) and icons that signal the presence of tools such as search functions. Icons are an efficient way of signalling additional content when the meaning of the symbol is understood. In digital environments, however, readers often train themselves to block out marginal content, which may be filled with advertisements and footnotes, such as the "small print" in Terms of Agreement. 1 Raymond Clemens and Timothy Graham, Introduction to Manuscript Studies (Ithaca and London: Cornell University Press, 2007), 37; Paul Saenger, Space Between Words: The Origins of Silent Reading (Stanford, CA: Stanford University Press, 1997), 75-76; Timothy Graham, "Glosses and Notes in Anglo-Saxon Manuscripts," in Working with Anglo-Saxon Manuscripts, ed. Gale R. Owen-Crocker (Exeter: University of Exeter Press, 2009), 169-71; M.B. Parkes, Pause and Effect: An Introduction to the History of Punctuation in the West (Berkeley & Los Angeles: University of California P, 1993), 115 (note 2); C. F. R. de Hamel, Glossed Books of the Bible and the Origins of the Paris Booktrade (Woodbridge: D. S. Brewer, 1984), 30-31; Mildred Budny, "Assembly Marks in the Vivian Bible and Scribal, Editorial, and Organizational Marks in Medieval Books," in Making the Medieval Book: Techniques of Production, ed. Linda L. Brownrigg (Los Altos Hills, CA: Anderson-Lovelace, 1995)	2 E.g. William W. E. Slights, Managing Readers: Printed Marginalia in English Renaissance Books (Ann Arbor: University of Michigan Press, 2001), 176-77; David Carlson, "Nicholas Jenson and the Form of the Renaissance Printed Page," in The Future of the Page, ed. Peter Stoicheff and Andrew Taylor (Toronto: University of Toronto Press, 2004), 91-110 at 95-98. 3 E.A. Lowe, "The Oldest Omission Signs in Latin Manuscripts: Their Origin and Significance," in Paleographical Papers 1907-1965, edited by Ludwig Bieler, vol. 2 (Oxford: Oxford University Press, 1972), 349-80; Clemens and Graham, Introduction, 37-39. 4 Lowe, "Oldest Omission Signs," 378. 5 Lowe, "Oldest Omission Signs," 363. 6 Budny, "Assembly Marks," 208-209. 7 N. R. Ker, English Manuscripts in the Century after the Norman Conquest (Oxford: Clarendon Press, 1960), 50. 8 Clemens and Graham, Introduction, 37; Paul Saenger,"Reading in the Later Middle Ages," in A History of Reading in the West, ed. Cavallo and Chartier (Amherst: University of Massachusetts Press, 1999), 120-48 at 122. 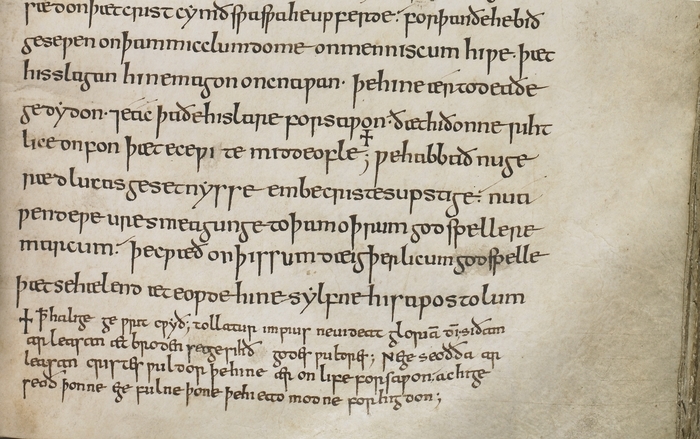 9 For some examples in Anglo-Saxon manuscripts, see Alexander R. Rumble, "Cues and Clues: Palaeographical Aspects of Anglo-Saxon Scholarship," in Form and Content of Instruction in Anglo-Saxon England in Light of Contemporary Manuscript Evidence, ed. Patrizia Lendinara, Loredana Lazzari, and Maria Amalia D'Aronco (Turnhout: Brepols, 2007), 115-130, especially at 122-24. 10 Kevin Kiernan, "Reading Cædmon's 'Hymn' with Someone Else's Glosses," Representations 32 (1990): 157-74. 11 Jacqueline Hamesse, "The Scholastic Model of Reading," in A History of Reading in the West, ed. Cavallo and Chartier, 103-19 (see also Cavallo and Chartier’s Introduction, 15-20); Mary A. Rouse and Richard H. Rouse, "Statim invenire: Schools, Preachers, and New Attitudes to the Page," in Authentic Witnesses: Approaches to Medieval Texts and Manuscripts (Notre Dame, IN: University of Notre Dame Press, 1991); M. B. Parkes, “The Influence of the Concepts of Ordinatio and Compilatio on the Development of the Book,” in Medieval Learning and Literature: Essays Presented to Richard William Hunt, ed. J. J. G. Alexander and M. T. Gibson (Oxford: Clarendon Press, 1976), 115-41. 12 Richard H. Rouse, "Backgrounds to Print: Aspects of the Manuscript Book in Northern Europe of the Fifteenth Century," in Authentic Witnesses: Approaches to Medieval Texts and Manuscripts, by Mary A. Rouse and Richard H. Rouse (Notre Dame, IN: University of Notre Dame Press, 1991), 449-66 at 465; Clemens and Graham, Introduction, 39-43. 13 Parkes, "Influence," 116-17; de Hamel, Glossed Books, 15-27, 31. 14 Sylvia Huot, "Visualization and Memory: The Illustration of Troubadour Lyric in a Thirteenth-Century Manuscript," Gesta 31 (1992): 3-14; Stephen G. Nichols, "'Art' and 'Nature': Looking for (Medieval) Principles of Order in Occitan Chansonnier N (Morgan 819)," in The Whole Book: Cultural Perspectives on the Medieval Miscellany, ed. Stephen G. Nichols and Siegfried Wenzel (Ann Arbor: University of Michigan Press, 1996), 83-121. 15 Cambridge, Corpus Christi College MS 26: Matthew Paris, Chronica majora, ca. 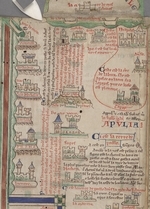 1250, vol. 1; Suzanne Lewis, The Art of Matthew Paris in the "Chronica Majora" (Berkeley: University of California Press, 1987), 323-64, 323-64; Daniel K. Connolly, The Maps of Matthew Paris: Medieval Journeys Through Space, Time and Liturgy (Woodbridge: Boydell Press, 2009), 3. 16 Daniel K. Connolly, "Imagined Pilgrimage in the Itinerary Maps of Matthew Paris," The Art Bulletin, 81.4 (December 1999) http://www.jstor.org/stable/3051336, at 615. 17 Connolly, “Imagined Pilgrimage,” 598-622; Lewis, Art of Matthew Paris, discussion at 325 and illustration at 343. 18 Saenger, "Reading," 134. 19 William H. Sherman, Used Books: Marking Readers in Renaissance England (Philadelphia: University of Pennsylvania Press, 2008), at 71-73; Slights, Managing Readers, 101-27. 20 David McKitterick, Print, Manuscript and the Search for Order, 1450-1830 (Cambridge: Cambridge University Press, 2003), 97-138. 21 H. J. Jackson, Marginalia: Readers Writing in Books (Yale University Press, 2001), 44-51. 22 Anthony Grafton, "The Humanist as Reader," in A History of Reading in the West, eds. Cavallo and Chartier, 179-212; Sherman, Used Books; Evelyn B. Tribble, Margins and Marginality (Charlottesville: University Press of Virginia, 1993); Slights, Managing Readers. 23 Sherman, Used Books, 77; see also Slights, Managing Readers, 123. 24 Slights, Managing Readers, 118; Sherman, Used Books, 74-84; Femke Molekamp, "'Of the Incomparable Treasure of the Holy Scriptures': The Geneva Bible in the Early Modern Household," in Literature and Popular Culture in Early Modern England, ed. Matthew Dimmock and Andrew Hadfield (Burlington, VT: Ashgate, 2009); Tribble, Margins, 11-56; Jackson, Marginalia, 51-53; McKitterick, Print, Manuscript, 37-40. 25 William W. E. Slights, "Back to the Future -- Littorally: Annotating the Historical Page," in The Future of the Page, ed. Peter Stoicheff and Andrew Taylor (Toronto: University of Toronto Press, 2004), 91-110, at 77. 26 Alexander Pope, The Dunciad: with Notes Variorum, and the Prolegomena of Scriblerus (London: Lawton Gilliver, 1729), ed. Allison Muri and Catherine Nygren at http://grubstreetproject.net/works/T5549; see p. 72. See also Anthony Grafton, The Footnote: A Curious History (Cambridge, MA: Harvard University Press, 1997), 114-18. 27 Evelyn B. Tribble, "'Like a Looking-Glas in the Frame': From the Marginal Note to the Footnote," in The Margins of the Text, ed. D. C. Greetham (Ann Arbor: University of Michigan Press, 1997), 229-44; Slights, Managing Readers, 16. 28 We gratefully acknowledge the practical assistance and kind advice of Stephen G. Nichols, Erik Kwakkel, Brent Nelson, Alan Galey, and Corie Wiebe. Any errors or infelicities are, of course, our own. We also thank the Parker Library of Corpus Christi College, Cambridge; the British Library; the Bodleian Library, Oxford; and the Thomas Fisher Library of the University of Toronto, for permission to use images of items in their collections. This article arose from work done for the Medieval Codes project (http://medievalcodes.ca) at the University of Saskatchewan with support from the University of Saskatchewan Summer Student Employment Program, the University of Saskatchewan Interdisciplinary Centre for Culture and Creativity, and the Social Sciences and Humanities Research Council of Canada. Budny, Mildred. "Assembly Marks in the Vivian Bible and Scribal, Editorial, and Organizational Marks in Medieval Books." In Making the Medieval Book: Techniques of Production. Proceedings of the Fourth Conference of the Seminar in the History of the Book to 1500, Oxford July 1992, edited by Linda L. Brownrigg, 199-239. Los Altos Hills, CA: Anderson-Lovelace, 1995. Carlson, David. "Nicholas Jenson and the Form of the Renaissance Printed Page." In The Future of the Page, edited by Peter Stoicheff and Andrew Taylor, . Toronto: University of Toronto Press, 2004. Clemens, Raymond and Timothy Graham. Introduction to Manuscript Studies. Ithaca and London: Cornell University Press, 2007. Connolly, Daniel K. The Maps of Matthew Paris: Medieval Journeys Through Space, Time and Liturgy. Woodbridge: Boydell Press, 2009.
de Hamel, C. F. R. Glossed Books of the Bible and the Origins of the Paris Booktrade. Woodbridge: D. S. Brewer, 1984. Grafton, Anthony. "The Humanist as Reader." In Cavallo and Chartier, A History of Reading in the West, 179-212. Graham, Timothy. 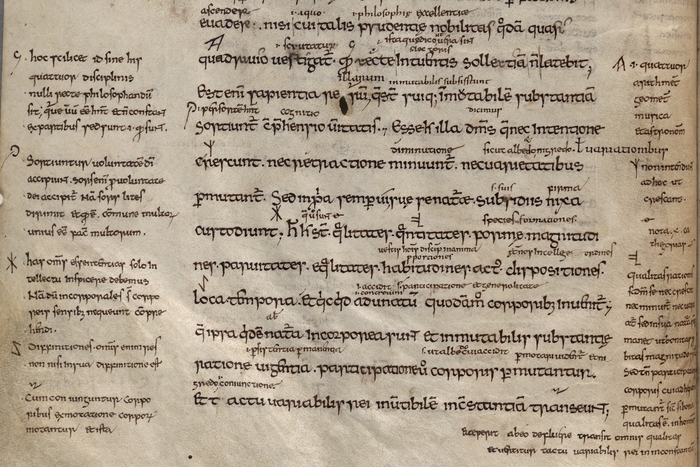 "Glosses and Notes in Anglo-Saxon Manuscripts." In Working with Anglo-Saxon Manuscripts, edited by Gale R. Owen-Crocker, 169-71. Exeter: University of Exeter Press, 2009. Hamesse, Jacqueline. "The Scholastic Model of Reading." In Cavallo and Chartier, A History of Reading in the West, 103-19. Huot, Sylvia. "Visualization and Memory: The Illustration of Troubadour Lyric in a Thirteenth-Century Manuscript." Gesta 31 (1992): 3-14. 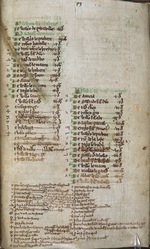 Ker, N. R. English Manuscripts in the Century after the Norman Conquest. Oxford: Clarendon Press, 1960. Kiernan, Kevin. "Reading Cædmon's 'Hymn' with Someone Else's Glosses." Representations 32 (1990): 157-74. Lewis, Suzanne. The Art of Matthew Paris in the "Chronica Majora." Berkeley: University of California Press, 1987. Lowe, E. A. "The Oldest Omission Signs in Latin Manuscripts: Their Origin and Significance." In Paleographical Papers 1907-1965, edited by Ludwig Bieler, vol. 2, 349-80. Oxford: Oxford University Press, 1972. McKitterick, David. Print, Manuscript and the Search for Order, 1450-1830. Cambridge: Cambridge University Press, 2003. Molekamp, Femke. "'Of the Incomparable Treasure of the Holy Scriptures': The Geneva Bible in the Early Modern Household." In Literature and Popular Culture in Early Modern England, edited by Matthew Dimmock and Andrew Hadfield, 121-35. Burlington, VT: Ashgate, 2009. Nichols, Stephen G. "'Art' and 'Nature': Looking for (Medieval) Principles of Order in Occitan Chansonnier N (Morgan 819)." In The Whole Book: Cultural Perspectives on the Medieval Miscellany, edited by Stephen G. Nichols and Siegfried Wenzel, 83-121. Ann Arbor: University of Michigan Press, 1996. Parkes, Malcolm Beckwith. "The Influence of the Concepts of Ordinatio and Compilatio on the Development of the Book." In Medieval Learning and Literature: Essays Presented to Richard William Hunt, edited by J. J. G. Alexander and M. T. Gibson, 115-41. Oxford: Clarendon Press, 1976. Pope, Alexander. The Dunciad: with Notes Variorum, and the Prolegomena of Scriblerus. London: Lawton Gilliver, 1729. Edited by Allison Muri and Catherine Nygren at http://grubstreetproject.net/works/T5549. Rouse, Richard H. "Backgrounds to Print: Aspects of the Manuscript Book in Northern Europe of the Fifteenth Century." In Authentic Witnesses: Approaches to Medieval Texts and Manuscripts, by Mary A. Rouse and Richard H. Rouse, 449-66. Notre Dame, IN: University of Notre Dame Press, 1991. 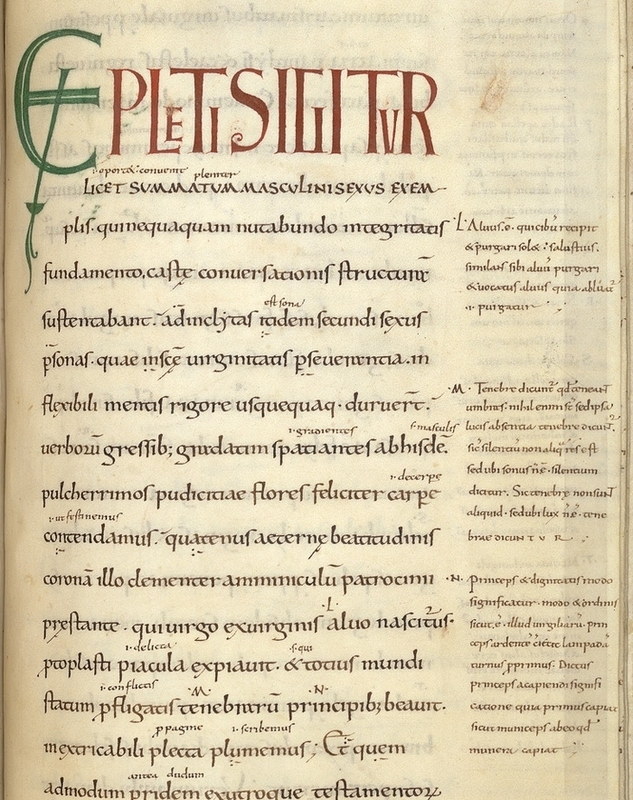 Rumble, Alexander R. "Cues and Clues: Palaeographical Aspects of Anglo-Saxon Scholarship." In Form and Content of Instruction in Anglo-Saxon England in Light of Contemporary Manuscript Evidence, edited by Patrizia Lendinara, Loredana Lazzari, and Maria Amalia D'Aronco, 115-30. Turnhout: Brepols, 2007. Saenger, Paul. Space Between Words: The Origins of Silent Reading. Stanford, CA: Stanford University Press, 1997. Saenger, Paul. "Reading in the Later Middle Ages." In Cavallo and Chartier, A History of Reading in the West, Amherst: University of Massachusetts Press, 1999. 120-48. Slights, William W. E. Managing Readers: Printed Marginalia in English Renaissance Books. Ann Arbor: University of Michigan Press, 2001. Slights, William W. E. "Back to the Future -- Littorally: Annotating the Historical Page." in The Future of the Page, ed. Peter Stoicheff and Andrew Taylor. Toronto: University of Toronto Press, 2004, 91-110. Tribble, Evelyn B. "'Like a Looking-Glas in the Frame': From the Marginal Note to the Footnote." In The Margins of the Text, edited by D. C. Greetham, 229-44. Ann Arbor: University of Michigan Press, 1997.